Wow. Still can't believe it. I've had two days to soak it in, and still, I don't know what to say. I mean, I feel like I literally won the cup...don't you? 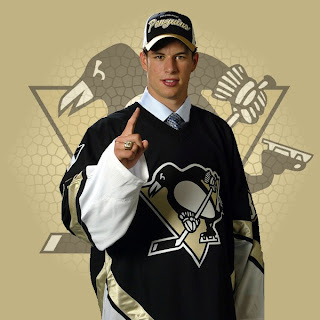 Though I figured, since a few hundred people visit Pens Universe everyday, and since, well, The Penguins did win the Cup for the first time since I was 14 its only prudent to offer my most magnificent post to date. But even now I can't really think of the right words to say. To be honest I've been reading everyone else stuff. Empty Netters, Pensburgh, Pesonen and the Pens, Hockey Buzz with Metzer, Smilin' like a Butcher's Dog, and The Pens Broads. Particularly The PensBlog though, because they're doing an excellent job at keeping everyone abreast of everyone's experiences. More people send them pics and comment on there than could be imagined. So of course, I'm steady rockin' all night long. So for me, the right words, I don't got 'em. I mean, 16 wins-What a Ride, that's all I can say. Did I think that when I created the image you see above that I would get to "x-ing" them all out, honestly, I didn't. Obviously I wanted to, and I really thought this team could do it, there's just a lot that runs through your mind when your team enters the playoffs. Especially since we went last year and lost...at home...to Detroit. You know how hard it is to get to the Cup finals, let alone win it. Then again...They did. I said at one point I felt like I won the lottery. Well back in 2005, I did. I just didn't think I'd get the full payout so soon. Winning the lottery is a good way of explaining this feeling. Are you going to the parade today? I cant wait!